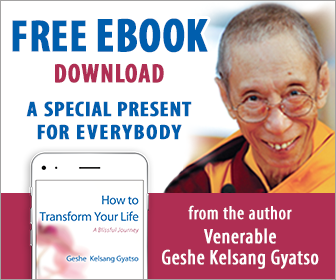 The following is extracted from a talk given by Venerable Geshe Kelsang on the occasion of the opening of the First Kadampa Temple August 1 1997. ‘At the very beginning when we were designing this building we based it on the mandala of Buddha Heruka, who is the Compassion Buddha of Highest Yoga Tantra. From this point of view it has many special preeminent qualities that indicate it is not an ordinary building. The Temple has four doors, and is surrounded by eight auspicious signs. On top of the wall, on each side, are two deer and a Dharma Wheel. At the very top there is a golden five-pronged vajra. These things indicate special preeminent qualities which reveal that this Temple is a holy place. The four doors symbolize the four doors of liberation. These are four different types of wisdom realizations that are explained in Essence of Vajrayana. These are the four doors through which we can enter the path to liberation. They are the basic understandings that are methods for attaining permanent liberation from suffering. The four doors have the same symbolism as Heruka’s four faces. They teach us that if we want to attain permanent liberation from suffering we must enter the four doors, that is, develop four special wisdom realizations that understand the ultimate truth of things; that understand directly the way things actually exist. The four doors therefore teach us the spiritual path. Whenever we see any of the four doors of the Temple it should remind us that if we really want to attain permanent liberation from suffering and problems we must enter one of the four doors of liberation. Whenever we enter, we should imagine, ‘I am now entering the gateway or doorway to liberation.’ This will create a special imprint or potential, or karma, in our mind. There are many extensive explanations of the four doors. According to Sutra there are three doors of liberation, but according to Highest Yoga Tantra there are four. However, there is no contradiction. We can understand more details about this later. The lotus flower symbolizes purity, which indicates that we need to put great effort into becoming a pure being by practising the Bodhisattva’s way of life – cultivating and maintaining a good heart and then trying to engage in actions that are similar to those of Bodhisattva. In other words, the lotus reminds us that we should not remain always as an impure, ignorant being, but strive to become a pure being by practising the Bodhisattva’s way of life. 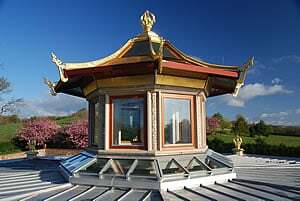 Above each doorway there are two deer and a Dharma Wheel, and at the very top of the Temple there is a vajra. Together, these symbolize the stages of the path of Highest Yoga Tantra. The eight auspicious signs symbolize in general how to progress along the Buddhist path, and the deer, Dharma Wheel, and top vajra teach us the stages of the path of Highest Yoga Tantra. The male deer symbolizes the realization of great bliss, the female deer the realization of emptiness, and the Dharma Wheel the union of these two. Through progressing in this union of great bliss and emptiness, finally we will attain the five omniscient wisdoms of a Buddha, which are symbolized by the top five-pronged vajra. In summary, the symbolism of the Temple is as follows: Through progressing in the basic practice symbolized by the eight auspicious signs and then progressing in the uncommon spiritual path of Highest Yoga Tantra that is the union of great bliss and emptiness, finally we will attain Buddha’s five omniscient wisdoms. In this way we can understand that this Temple is not ordinary but a very holy place.